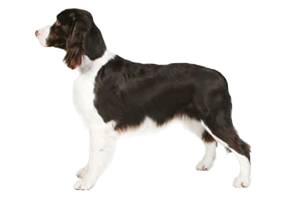 The English Springer Spaniel is a spaniel, a gundog which is used for flushing prey. They search for game birds, which in turn panic when found and appear for the waiting hunter. Once the prey has been shot they will retrieve the birds on command. • They are the result of French knights breeding their hunting hounds and pointers to Arabic Greyhounds while they were in the Holy Land in the 11th century. • Ancient Romans importing spaniel-type dogs to Britain by trade routes in Asia. With this theory spaniels would have descended from the same short-faced ancestors as those shared by the Pekingese, Pug, and Shih Tzu. • Specifically that the dogs from Spain were brought by Celts moving into Britain as early as 900 BC. Supporters of this theory suggest the Agassian hunting dog as the spaniels’ (in particular the Welsh Springer Spaniel's) ancestor. Regardless of which theory is true, they were commonly accepted as Spanish dogs. These early dogs were eventually separated into three types, Land Spaniels, Water Spaniels and Spaniel Gentles. It is from the Land Spaniels (flushing dogs) that today’s English Springer Spaniel descends and it remains close to the original type. Further separation was made in the late 1800s when Land Spaniels were divided into two types, Springing (also known as Hawking or Starter) and Cocking Spaniels. Until that point pups in the same litter would be divided for the two tasks, the larger dogs were destined to be Springing and smaller became Cocking (Cocker) Spaniels. In earlier days the Springer Spaniel was known as the Norfolk Spaniel, supposedly due to a connection with the Duke of Norfolk. However, when further inquiry was made toward this claim it was found the breed was never kept by the Norfolk family. The Norfolk name was subsequently dropped and was then replaced with English Springer Spaniel. Is the English Springer Spaniel Right for You?